Map of Tuscany, Italy. Illustration by Jeff Quinn. More than half of Tuscany’s hillside vineyards are planted with Sangiovese grapes. Historically the region is known for its production of Chianti. In fact, the Chianti zone is the oldest appellation in the region. These sub-appellations may be featured on Chianti wine labels. Chianti Classico and Chianti Rufina are some of the most distinctive wines coming out of the Chianti area. While the wines must be mostly made from Sangiovese, a small percentage of additional varieties may be used. In the past, white varieties like Malvasia or Trebbiano could be added, though they’re no longer permitted. Native red grapes like Canaiolo Nero or Colorino are still allowed but not commonly added. Bordeaux varieties like Merlot or Cabernet Sauvignon are more likely additions. However, the current trend is to go local and aim for 100 percent Sangiovese from single vineyards, when possible. Tuscany is also renowned for the Sangiovese-based Vino Nobile di Montepulciano, which is made near the hill town of Montepulciano. These wines show similar characteristics as Chianti Riservas. Another Sangiovese-based wine, Brunello di Montalcino is a world-class red that often vies with Barolo for the reputation of Italy’s finest and most age-worthy wine. It must be made with 100 percent Sangiovese grapes. The region’s other most significant red wines are the famed Super Tuscans. A local take on the classic Bordeaux-style blend of Cabernet Sauvignon, Merlot, and Syrah (and sometimes Cabernet Franc), these wines were developed, in part, as a reaction to the restrictive regulations in Tuscany during the 1970s. At the time they emerged, they were considered some of the region’s best reds. Yet, somewhat ironically, they were technically table wine. In 1994, their Vino da Tavola (VdT) status was elevated to the Indicazione Geografica Tipica (IGT) denomination, which officially endowed these non-traditional wines with a premium quality rating just below the Denominazione di Origine Controllata (DOC), which at that time was reserved for more traditional regional wines. More recently, in the Super Tuscan heartland, Bolgheri and Bolgheri Sassicaia DOCs were established. While Super Tuscans are still sometimes released without DOC denominations, they are generally regarded as high- to very high-quality wines (and they typically have prices to match). Super Tuscans may be made from a single variety like Sangiovese or Cabernet Sauvignon, or a blend of some combination of these grapes and others, including Cabernet Franc, Merlot, Syrah, and Alicante (Grenache). But Tuscany isn’t just a red-wine-producing region. There are a number of white wines to be explored, including those made from Trebbiano, Vernaccia, and Vermentino. 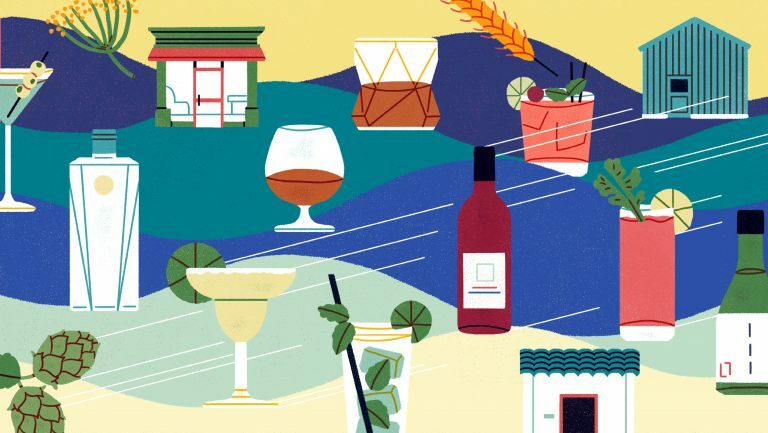 The region is also known for its dessert wine, Vin Santo, which is made from native varieties (usually white, but sometimes Sangiovese is used) and traditionally served with almond biscotti. Tuscany is a predominantly hilly region with vineyard elevations rising up to 550 meters above sea level. About a quarter of the landscape is mountainous and a scant 8 percent is officially classified as flat. 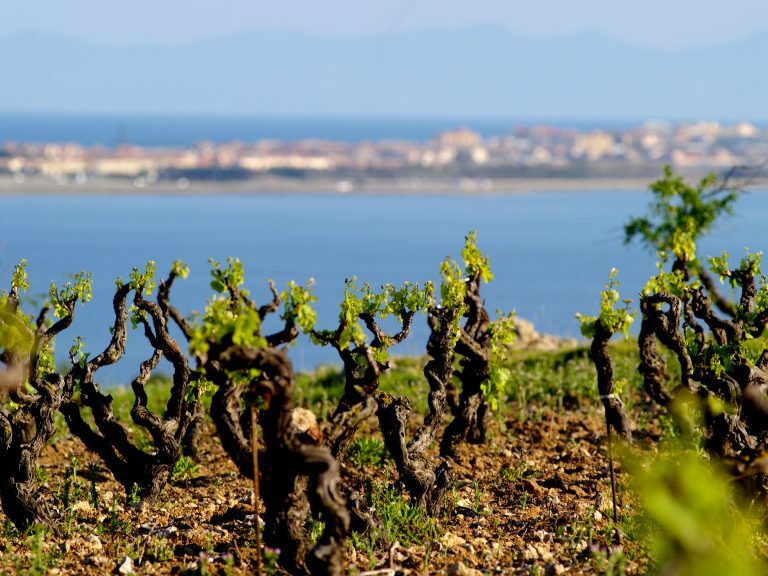 Approximately 57,942 hectares of the region’s nearly 23,000 square kilometers is under vine. Sangiovese grapes thrive in the interior hillside vineyards in the Chianti zone that runs between Florence and Siena, as well as in the Montalcino and Montepulciano areas, where its best expressions evolve. Cabernet Sauvignon flourishes in the warmer areas along the Tuscan coast. 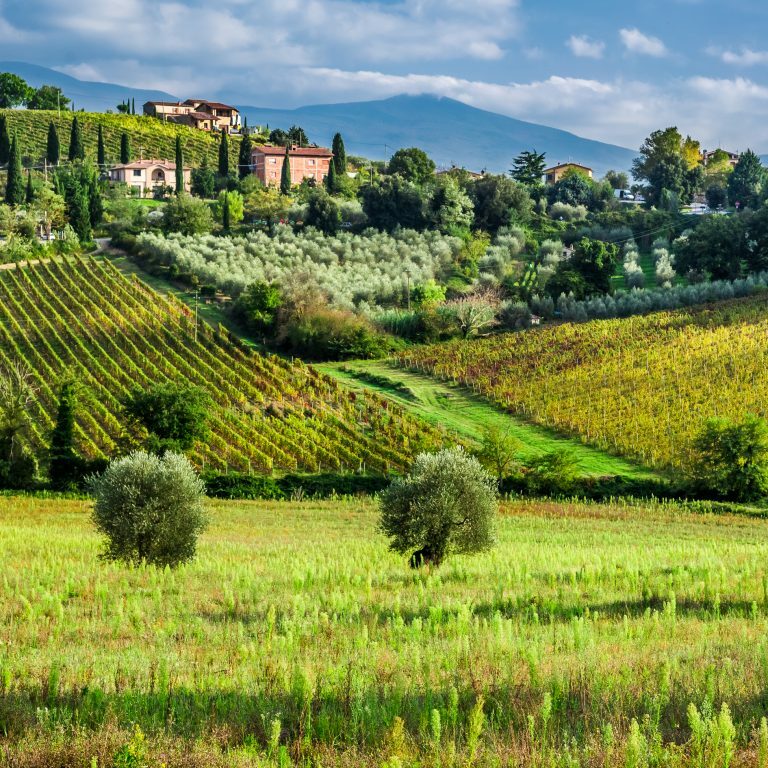 Soils in Tuscany range from soft and crumbly, marl-like clay-limestone and dense sandstone in the Apennine foothills to sandy clay around San Gimignano and gravelly clay and sandy soils in the Bolgheri and Maremma areas. Tuscany’s climate is Mediterranean with dry, hot summers; warm springs; and mild, rainy autumns and winters. Variations in altitude, exposition, and diurnal temperatures in the foothills contribute to climatic conditions that help balance the sugar, acidity, and aromatics in the grapes—primarily Sangiovese—planted there. Coastal areas like Bolgheri and Val di Cornia tend to be more temperate. In ancient times, the area of Tuscany and its environs were part of the Etruscan empire. The Etruscans were the first vintners to work the land. They trained their grapevines with natural, high-trellis supports like fig, olive, and nut trees. Eventually, the area was taken over by the Romans. During the Medieval period, wine was a major commodity in Tuscany. Wine sales were documented as early as 1079 in association with the Mercato Vecchio in Florence. 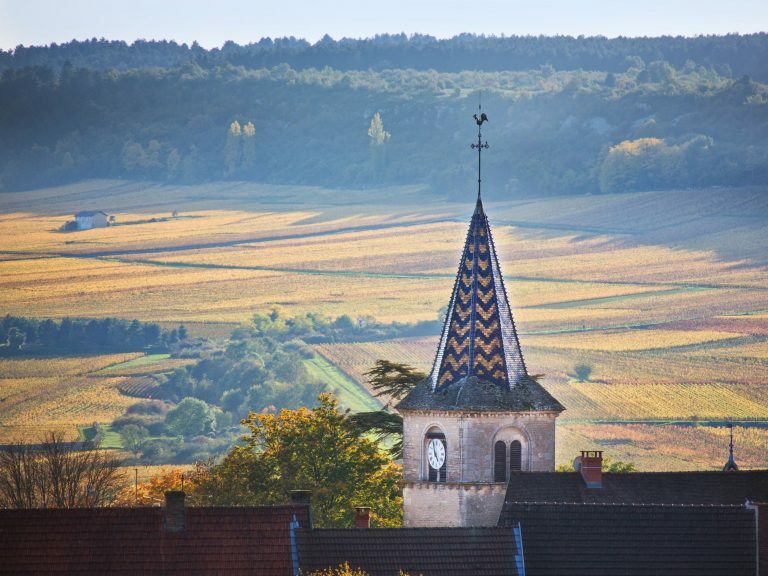 Local wine merchants formed a guild in 1282 in an attempt to promote and regulate their trade. Many of the Tuscan wines we know today—Chianti, Brunello, Trebbiano, and Vernaccia—can be traced back to the 14th century. From the time of the post-World War II reconstruction through the 1970s and ‘80s, Tuscan wine production focused largely on quantity over quality. It was also during this period that many of the region’s large estates, which had been historically owned by local nobility, were sold to non-Tuscans. 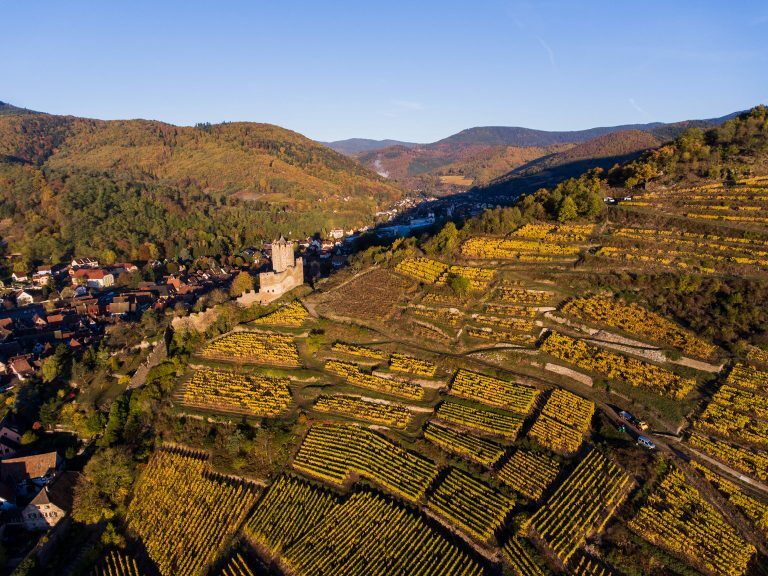 But the wine region went through a rebirth in the 1970s and ‘80s, which gave way to the premium quality regional wines that are world-renowned today. Meanwhile, the torch for Tuscan viticulture is being carried by the diverse mix of Tuscan, Italian, and foreign winemakers that have taken over the old estates—and introduced new ones. Tuscany’s appellation system includes three tiers of designations with IGT representing the lowest tier. 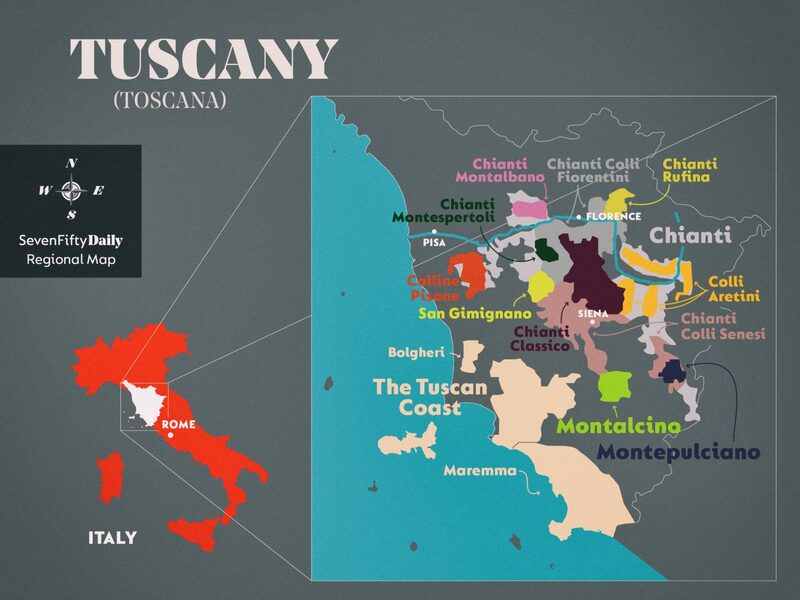 There are 58 appellations in Tuscany. Created in 1992, this designation identifies a level of quality and regional characteristics in a particular geographic area without requiring the wine (or the winemaker) to adhere to the strict requirements necessary for DOC or DOCG status. There are 6 IGTs in Tuscany. The DOC status was established in 1963 and indicates superior quality wine in Italy. There are 41 DOCs in Tuscany. Wines with DOCG status must pass an in-depth laboratory analysis and panel tasting to guarantee their merit. This denomination identifies Italy’s highest quality wines. The country began granting DOCGs in 1980. There are 11 DOCGs in Tuscany. Nearly two-thirds of Tuscany’s vineyards are planted with Sangiovese. It’s the region’s most important grape. Trebbiano is the most widely planted white variety, but as far as white wines go, Vernaccia and Vermentino have more to offer. In 2014, Tuscany produced nearly 2.78 million hectoliters of wine. The most widely planted grape in Tuscany is also the main variety in its most classic red wines: Chianti, Vino Nobile di Montepulciano, and Brunello di Montalcino. In 2014, 61.4 percent of the vines in Tuscany were Sangiovese. This variety does best in the region’s hillside vineyards. It results in medium- to full-bodied wines with lively acidity and firm tannins. Sangiovese-based wines tend to have an earthy character and distinctive sour and black cherry flavors. The best expressions are robust and age-worthy with additional herbal, spicy, toasty, and smoky notes. In 2014, 7.7 percent of Tuscany’s vineyards were planted with Merlot, 6.3 percent with Cabernet Sauvignon, 2 percent with Syrah, and 1.3 percent with Cabernet Franc. These are the main varieties featured in the Bordeaux-inspired Super Tuscan blends. (Sangiovese is often used in these blends, as well.) Super Tuscans tend to be smooth and elegant with notes of cherry, plum, blackberries, and hints of nutty and woody flavors. On its own, this grape typically yields fairly neutral and light white wines, but it has had a successful run as a blending grape. In the past, it was commonly used as a component in Sangiovese-based wines, though that practice has gone out of fashion. However, it’s still a staple in some white blends and in Vin Santo. In 2014, Trebbiano accounted for 5.9 percent of Tuscany’s vines. Though they only represented 2.1 percent of Tuscan vines in 2014, Vermentino-based wines are slowly gaining popularity. Vermentino tends to garner more of the spotlight in other Italian regions, but this hearty, late-ripening grape is slowly proving itself in coastal Tuscany as a wine that is able to translate the characteristics of the local terroir. At their best, these wines are fresh and balanced with notes of yellow peach, apricot, green apple, and citrus with a salty minerality. One of the region’s most historic wines, Vernaccia from San Gimignano was the first wine to receive the Italian DOC designation in 1966 and it ascended to DOCG status in 1993. Vernaccia tends to be crisp and floral with refreshing minerality. It made up 1.2 percent of vineyard plantings in Tuscany in 2014. 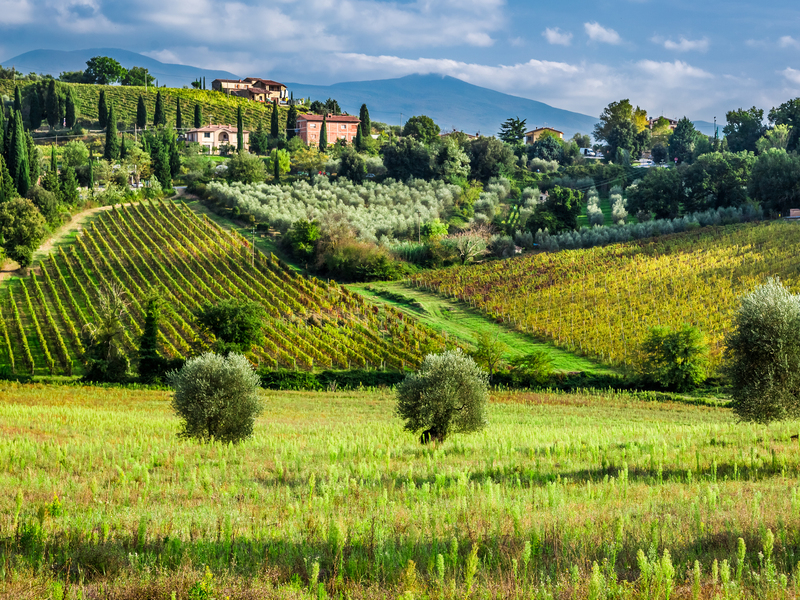 A small percentage of additional varieties are planted in Tuscany, including Canaiolo Nero, Colorino, Malvasia Bianca Lunga, Petit Verdot, and Chardonnay. What’s Happening in Tuscany Today? Organic and biodynamic wine practices continue to trend around the world, particularly in Europe. Tuscans are among the wine producers that are increasingly embracing sustainable practices in the vineyards and the cellar. The focus on native grapes and terroir-driven wines is also on the rise, both globally and in this region. Over the past few decades, Chianti winemakers have been shedding their reputation as producers of ubiquitous red wine in straw-covered bottles. These days, many of the best winemakers are focused on regional typicity and terroir-driven expressions of Sangiovese and other native varieties with respect to individual sub-appellations. Winemakers in this area are also eschewing the addition of native and Bordeaux varieties in an effort to hone 100 percent Sangiovese wines. In an additional effort to promote modernization and improve the quality of Chianti wines, the Consorzio Vino Chianti recently changed the region’s production regulations to reduce the maximum yield of grapes per hectare by 10 percent for the 2017 harvest. 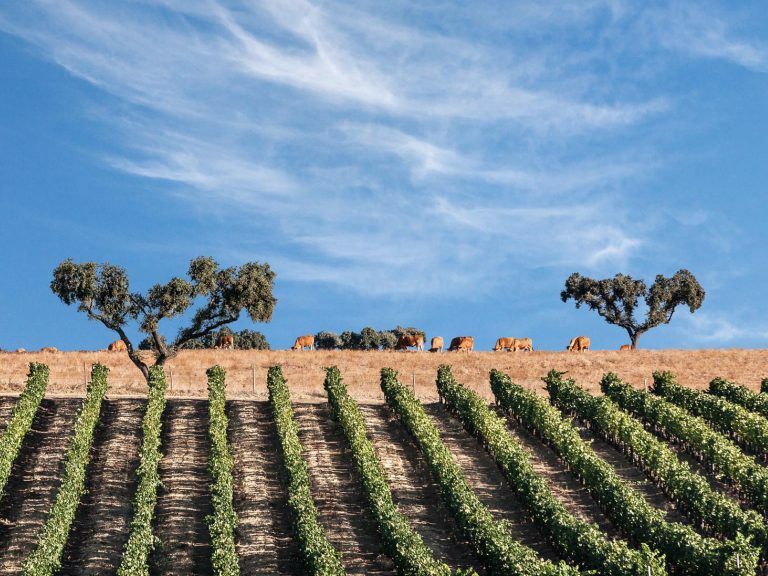 Bolgheri and the Maremma are typically considered ground zero for red Super Tuscan blends, but local Vermentino wines are riding a wave of attention for their striking ability to express coastal Tuscan terroir. In general, white wines in Tuscany get short shrift, but Vermentino may just change all that.